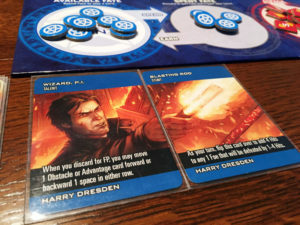 We review the Dresden Files Cooperative Card Game, published by Evil Hat. In the Dresden Files Cooperative Card Game, players must work together to solve the mysteries in each of the Dresden Files novels. If there is one book series that will cause me to immediately pause whatever I’m currently reading to dive into the next installment, it’s the Dresden Files. I’ve been addicted to the adventures of Harry Dresden for longer than I can remember. If you are reading this Jim Butcher, please write faster! So I’m sure you can imagine I’ve been looking forward to playing the Dresden Files Cooperative Card Game since it was announced last year. I always approach licensed games with healthy amount of caution, as it’s too easy for publishers to use our love of the source material to pass off a mediocre game. Did publisher Evil Hat Games choose that approach, or have they given us something Dresden fans will be salivating over for years to come. Let’s find out. 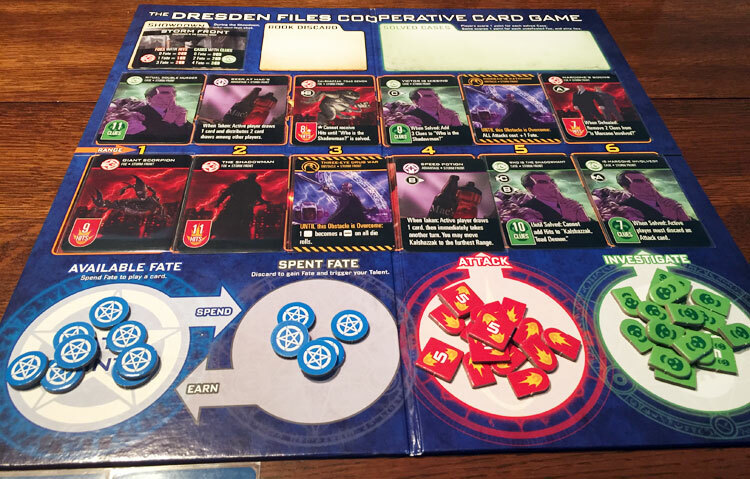 The Dresden Files Cooperative Card Game is a hand management card game for 1-5 players that takes about 30 minutes to play. The game plays well at about any player count. Players have four different types of cards in their deck. Each game of the Dresden Files is broken out into one of the many Dresden Files books. And once you have tackled all of those, there is a stack of “side jobs” you can play for added variety. Once you’ve selected a book for the game and each player chooses a character from the Dresden Files universe. Case cards are then dealt out into two, face up rows on the game board. Starting with the player controlling Harry Dresden (of course), each player takes one action on their turn. To play a card, a player must spend Fate Points (a shared pool of resources) equal to the cost of the card. The target card must also be in range. • Discard a Card for Fate: A player can discard a card and recover as many fate points as the cost would have been to play the card. The player may then also use their characters unique talents. • Use a Stunt: Each character has a special power called a Stunt that can be used once per game. • Pass: If you don’t want to (or can’t) take any of the above actions, you may pass by spending one fate point. Some cards will have a variable cost or power, which is resolved by rolling one or more fate dice. 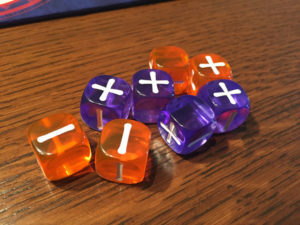 Players continuing taking turns in a clockwise manner until the Showdown Phase is triggered, which allows the players on last shot to win the game by rolling fate dice. If, after the Showdown Phase, the players have solved more cases than there are foes left on the board, they win! Any ties go in favor of the game. Fate points (in blue) are required to play cards. Discarding cards will get them back again. I can say one thing for Evil Hat Productions, they sure captured the essence of the Dresden Files Books. This game is hard to win. If you’ve read any of the Dresden Files novels, then you know that Harry is constantly up against a wall, usually in a no-win situation. And that’s essentially the feel of the Dresden Files Game. I feel like I’m constantly trying to tread water, barely keeping my head up. Which means that while the losses do pile up, when you win, it’s very, very satisfying. Each character has a unique stunt and talent. If you’ll notice from the gameplay overview above, players rarely, if ever, draw cards during the game. That means that the hand of cards you start with is all you get to use during the game. This is hand management to the extreme. This also has the added effect of making the game feel almost like a puzzle at times. Every card you play must be chosen carefully to make sure you are getting the maximum benefit from it. The Dresden Files game requires intense cooperation from among the players if you hope to have a chance to survive (again, like in the books). When it comes to the Fate Dice, I have a love/hate relationship. To many times my careful strategy has been spoiled by a bad fate roll. Yet they are probably necessary to the game to stop it from actually turning into a puzzle. In either case, they definitely add a degree of uncertainty in the game, and can really ratchet up the tension. 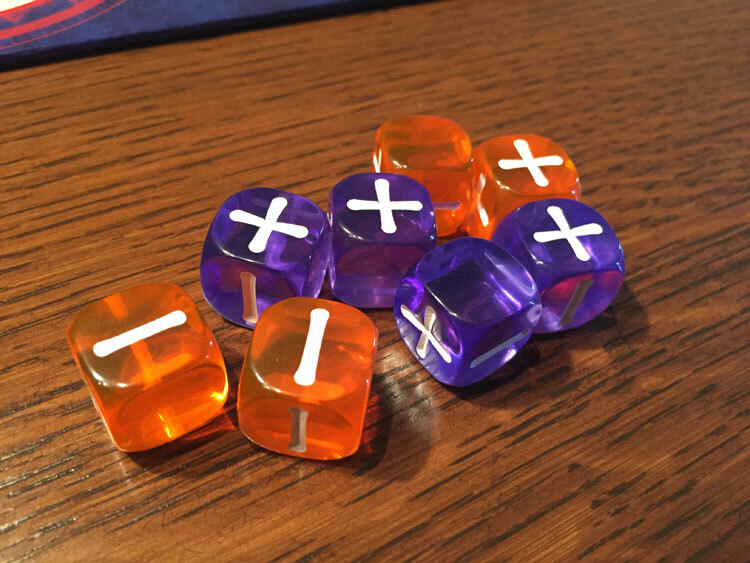 Fate dice have 2 “+” sides, 2 “-” sides, and 2 blank sides. Another highlight of the game has to be the fantastic artwork. Artists Chris McGrath and Tyler Walpole did an excellent job of bringing the characters from the Dresden universe to life. To be honest, my only gripe is that there wasn’t more unique artwork. Many of the cards will reuse artwork for the same type of card in a character deck (ala Marvel: Legendary). While I understand that more art would have cost exponentially more, it doesn’t make my wish for it any less. Other than that artwork request, my only other gripe with the theming is that I would have loved to see more text on the cards. While many of the cards are named straight out of the books, some pull quotes to go along with them would have been a welcome addition. 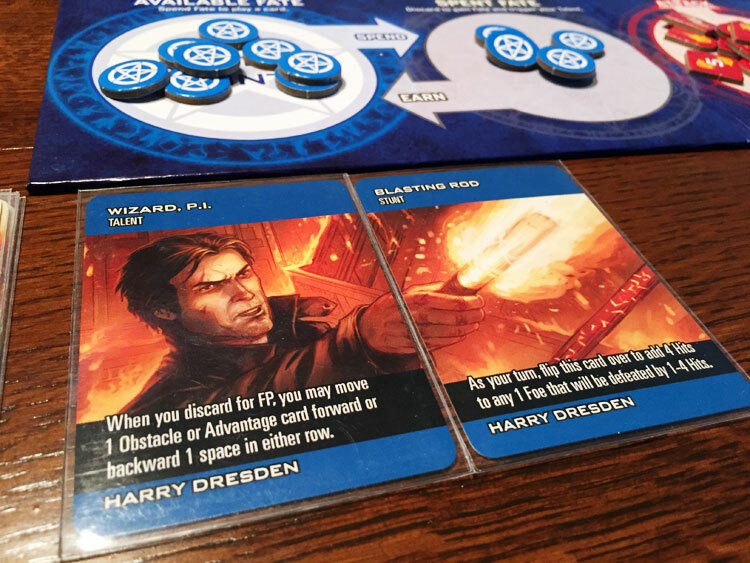 Finally, I feel like the Dresden Files card game scales really well. In fact, I think it makes a fantastic solo game. I almost never play solo games, usually preferring to just play a video game, but I’ve played this game at least half-a-dozen times by myself. The solo rules are great and I’ve had a lot of fun trying (and usually failing) to solve these cases. Some cards will have variables on them, which require the player to roll fate dice. 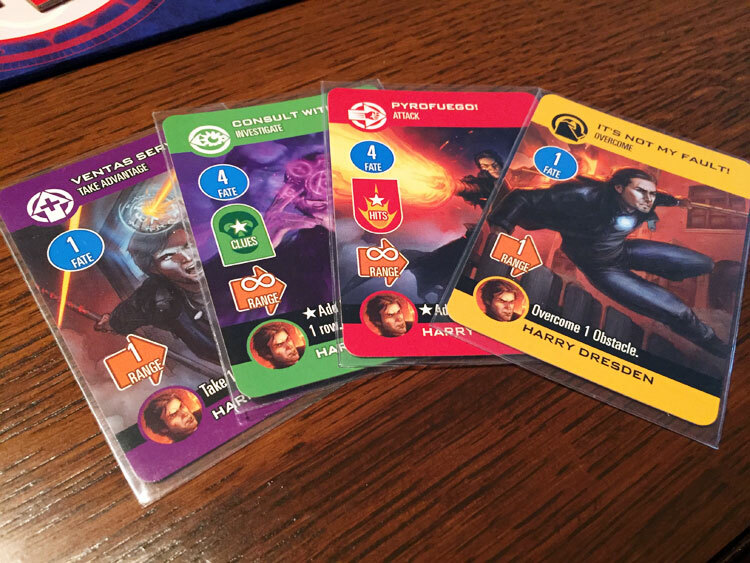 While the Dresden Files Cooperative Card Game isn’t perfect, I keep finding myself reaching for it to bring it back to the table. Part if it can be my love of the source material, but a bigger chuck is because this is a really fun game. The mechanics are solid, it’s easy to learn and teach, and I don’t have many games that play like it. Game designer Eric Vogel definitely gave us a game that’s both unique and has you coming back for more. 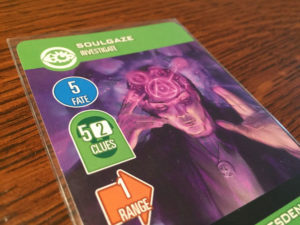 You don’t have to be a fan of the source material to enjoy the Dresden Files Cooperative Card Game (although that does help), as this one should appeal to anyone who loves trying to puzzle out a win, especially when the odds are stacked against you. The Dresden Files Card Game will be staying in my collection for a long time, and probably making its way to my table quite often. 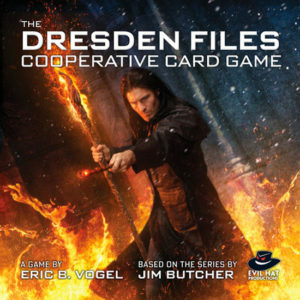 If you’d like to pick up a copy of the Dresden Files Cooperative Card Game, you can get it for about $40. Final Score: 4.5 Stars – A challenging and entertaining cooperative card game with plenty of replay value. • Pull quotes from the books would have been a nice touch.